On Thursday 28 March, at 17.00, the DP Visual Arts Exhibition was held in Art room 55 in the main building of Stockholm International School. Curated by the artists themselves, the exhibition featured the marvellous artworks of Maya Davison Kunhardt and Carmen Koidumäe, two grade 12 Visual Arts students. 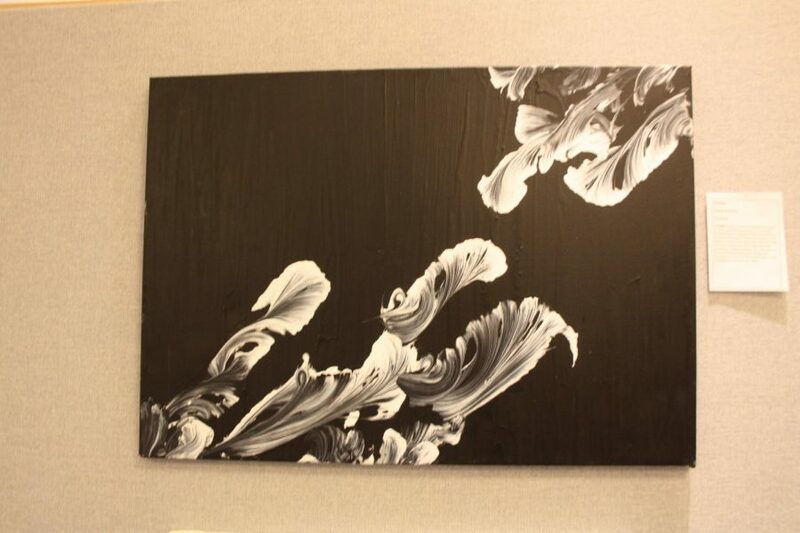 The IB Art exhibition is the culmination of the students’ IB Art experience. It is a showcase of the artworks that students have created and selected from over a span of two DP years. For the exhibition, Maya and Carmen individually presented a selection of their best work, conveying a common theme throughout the artworks. Maya D, a musician, has chosen to explore the ways people experience music. Throughout her artmaking process, she has developed the theme and decided to capture the diversifying elements within music, as well as the connection between music and movement. Maya wanted the exhibition to be read similarly to how a piece of music is heard, as she said in her rationale. She constructed and expressed the theme through her artworks in three different mediums: drawing, painting, and sculpture. She took a predominantly monochrome approach in her artworks, associating with the traditional black musical notes on white paper. On the other hand, Carmen takes us on a lively journey of emotions with her colourful strokes. As she wrote in her curatorial rationale: “I have always had an interest in reflecting how I respond or react to different events emotionally.” Carmen’s artworks depict the connection she has to her emotions and feelings. Her series of artworks showcased in the exhibition include ‘‘Longing’’, ‘‘Migraine’’, ‘‘Dreams’’, ‘‘Growth’’ and more. As suggested by the titles of the artworks, Carmen expresses her emotions connected with the experiences and creates a relatable atmosphere for the audience, through various mediums and materials: photography, painting, and drawing. The exhibition went successfully and the masterpieces were deeply enjoyed by those who came to see the exhibition. But don’t be disappointed if you did not have a chance to look at the amazing works created by our students at SIS this year, because the DP Art exhibition, as well as the Art showcase, repeats every year. So don’t miss out next year!